Sony MDR-DS6500 Wireless 7.1 CH Digital Surround Sound Headphones 3D Bluetooth . Like new . Tested . Working super good . Please see a pics for condition . Shipped with USPS Priority Mail. 7.1ch digital surround sound Headphones simulate a cinematic experience with 7.1ch surround and 3D sound. Feel thunderous bass and atmospheric echoes with precision. Connectivity Technology: Wireless. Sony MDR-DS6500. Shipped with USPS Priority Mail. Tuning : Auto Tuning on headphones. Weight (Approx.). (450 grams). Audio In : Optical Digital Input (x1), Analog Stereo Input mini jack (x1). Plug : Nickel, stereo mini plug. Audio Format(s) Supported : Compatible with Dolby Digital, Dolby Digital Surround EX, DTS, DTS-ES Matrix, and DTS-ES discrete. Sony MDR-DS6500 Digital Wireless 3D Surround Headphones, black, used in excellent condition. I would say this is warm sounding headphone. Sony MDR-DS6500 Wireless Surround Digital Headphones . Shipped with USPS Priority Mail. Like new just open box. Sony MDR-DS6500 Wireless Surround Digital Headphones - 2.4 GHz - 12-22000 Hz. Condition is New. Shipped with USPS Priority Mail. Open Box Sony MDR-DS6500 Wireless Surround Digital Headphones - 2.4 GHz - 12-22000 Hz - 3.5mm / Digital Optical / Composite Connectors - Black. Radio Frequency Range 2.4 GHz. Connect and use these Wireless headphones with any TV, Gaming Device, or electronic that uses 3.5mm inputs, SPDIF (digital optical/ TOSLINK), and composite audio! Enjoy features that include wireless freedom, 7.1 virtual surround sound, and 20 hours of long battery life for an all-in- one sound system. Many 3D movies include a 7.1 audio mix that these headphones can process, however if you don't have a 3D TV or 7.1 audio mix, you will still get great audio clarity with stereo sound and 5.1 surround sound as well. Feel thunderous bass and atmospheric echoes with precision. Connectivity Technology: Wireless. 7.1ch digital surround sound Headphones simulate a cinematic experience with 7.1ch surround and 3D sound. 7.1ch digital surround sound Headphones simulate a cinematic experience with 7.1ch surround and 3D sound. Connectivity Technology: Wireless. Feel thunderous bass and atmospheric echoes with precision. Baby & Kids. Phone & Accessories. Pharmacy, Health & Beauty. Clothing & Luggage. NE, NV, NH, NM, NY, NC, ND, MP, OH, OK, OR, PW, PA, PR, RI, SC, SD, TN, TX, UT, VT, VI, VA, WA, WV, WI, WY. 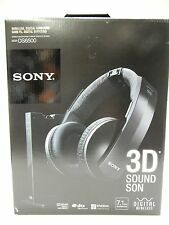 Sony MDR-DS6500 Wireless Surround Digital Headphones - 2.4 GHz - 12-22000 Hz - 3.5mm / Digital Optical / Composite Connectors - Black - Open Box. Connect and use these Wireless headphones with any TV, Gaming Device, or electronic that uses 3.5mm inputs, SPDIF (digital optical/ TOSLINK), and composite audio! Surround sound to get the most out of your content. Manufacturer: Sony. Automatic tuning gives you the best digital signal. Excellent Condition. Complete with everything original. Our highly experienced and friendly staff are here to help resolve any problems you may have. NOB Sony MDR-DS6500 Wireless Surround Digital Headphones - 2.4 GHz - 12-22000 Hz - 3.5mm / Digital Optical / Composite Connectors - Black. Sony MDR-DS6500 Wireless Surround Digital Headphones - 2.4 GHz - 12-22000 Hz - 3.5mm / Digital Optical / Composite Connectors - Black.